To Cite: Kim S H, Kim J Y, Park W C, Kim M K, Kim T J. Sequential Sonographic Features of Primary Invasive Aspergillosis Involving Only the Thyroid Gland: A Case Report and Literature Review, Iran J Radiol. 2016 ; 13(1):e27890. doi: 10.5812/iranjradiol.27890. A 29-year-old woman with systemic lupus erythematosus (SLE) presented with palpitation and neck swelling. Initial sonography showed an ill-defined hypoechoic lesion in the right thyroid gland, mentioning subacute thyroiditis. The patient received conservative care for one week. However, her neck swelling worsened and she complained of dyspnea. Follow up sonography showed marked enlargement of both thyroid glands. Irregular infiltration of hypoechoic lesions was detected along the subcapsular region of both thyroid glands. She underwent immediate intubation to secure the airway and total thyroidectomy. 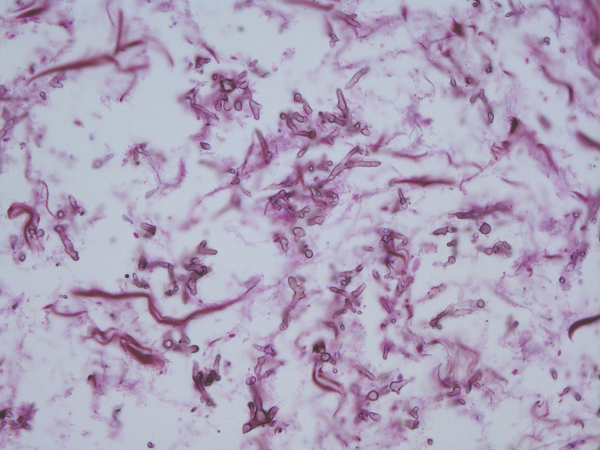 Histopathological staining revealed features of fungal thyroiditis with fungal hyphae characteristic of Aspergillus. There was no abnormality in the lung or paranasal sinuses. In this report, we describe the sequential sonographic findings of invasive aspergillosis in the thyroid gland presenting as progressive enlargement without other organ involvement. Invasive aspergillosis is a common form of fungal infection in immunocompromised patients. High-risk groups include patients with human immunodeficiency virus infection, leukemia, autoimmune diseases, and organ-transplant patients on pharmacological immunosuppression (1, 2). Pulmonary involvement is the typical presentation of invasive aspergillosis. However, extrapulmonary disease including thyroid involvement is also found frequently at autopsy. According to previous observations in cases of extrapulmonary spread, prognosis of fungal thyroiditis was poor and treatment was ineffective (3, 4). Survival of patients with invasive aspergillosis depends on early diagnosis and prompt initiation of therapeutic measures. Therefore, sonography that is usually carried out in patients with fungal thyroiditis is very important. According to PubMed search, there is only one case of sonographic finding of invasive aspergillosis involving the thyroid gland without disseminated aspergillosis (5). The sequential sonographic finding provides important information on the early diagnosis of invasive aspergillosis involving only the thyroid gland. A 29-year-old woman was diagnosed with SLE three months ago complicated by end-stage renal disease presented with melena. Physical examination revealed anemic features with a temperature of 38.4°C, blood pressure of 130/90 mmHg, and pulse of 90 beats per minute. Laboratory studies revealed severe anemia (hemoglobin 5.8 g/dL, normal range 12 - 16 g/dL), thrombocytopenia (platelet count 79,000/mm3, normal range 150,000 - 450,000/mm3), and leukopenia (white blood cell count 1,050/mm3, normal range 5,000 - 10,000/mm3). Chest X-ray was normal. We could not found the focus of infection. Emergency gastroduodenoscopy revealed several ulcers with hematoma in the stomach and duodenum. There was no evidence of fungal infection around the ulcer. Hemoclip was applied for bleeding control and the bleeding stopped. She was hospitalized for observation while receiving blood transfusion. After four days, she complained of right neck mass and palpitation. Sonography (iU-22; Philips Medical System, Bothwell, WA, USA, 5 - 12 MHz high frequency linear-array transducer) of the thyroid showed diffuse enlargement of the right thyroid gland and the anterior-posterior (AP) diameter was 2.1 cm. An ill-defined hypoechoic lesion involving the middle and upper portion of the right thyroid gland was detected. In this area, sonographic tenderness was present. Referentially, the echogenicity of a normal thyroid gland is slightly higher than the neck muscle and it is homogeneous. The size of a normal thyroid lobe is 1.3 - 1.8 cm in the anteroposterior dimension (6). Color Doppler images revealed poor vascularity within this hypoechoic lesion. The left lobe was unremarkable. There was no evidence of enlarged cervical lymph nodes (Figure 1). Thyroid function tests revealed a thyrotropin (TSH) level of less than 0.02 μIU/mL (normal range: 0.38 - 4.94 μIU/mL) and free thyroxine (FT4) level of 4.05 ng/dL (normal range: 0.71 - 1.85 ng/dL), indicating thyrotoxicosis. We considered subacute thyroiditis with hyperthyroidism. She was empirically treated with beta blocker and steroid for subacute thyroiditis. However, the patient continued to complain of palpitation with a growing neck mass. Repeat thyroid function showed a higher increase of free thyroxine (FT4) level to 7.83 ng/dL with serum TSH level of 0.02 μIU/mL. Propylthiouracil was added to the treatment strategy, but there was no significant effect and the patient complained of progressive neck swelling and palpitation. 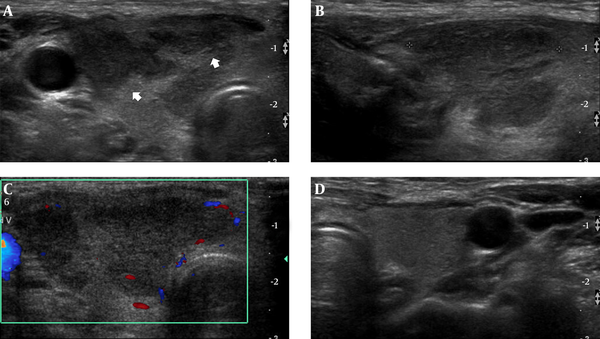 After two weeks from the initial sonography, follow up sonography revealed a significant increase in the size of both thyroid glands. The AP diameter was 4cm with lobulating contour. 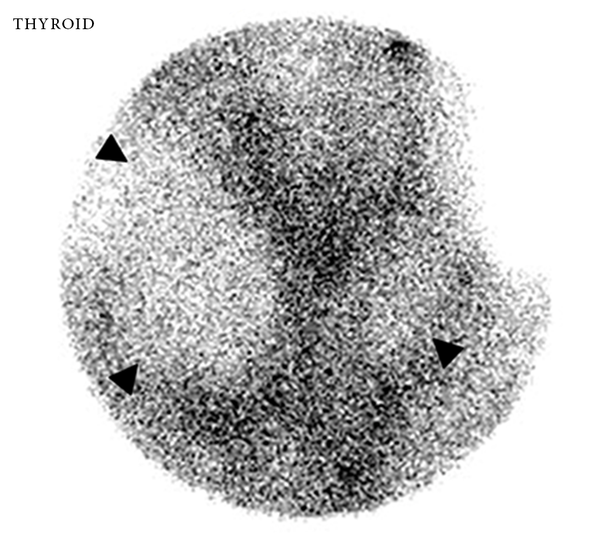 The entire thyroid gland showed irregular hypoechogenicity along the subcapsular region with isoechogenicity in the central portion (Figure 2). Sonographic findings suggested marked progression of thyroiditis. On scintigraphy, both thyroid glands were noted as large photon defect (Figure 3). We suspected other diseases such as fungal or suppurative thyroiditis rather than subacute thyroiditis. There was no evidence of fungal infection involving the lung in chest computerized tomography (CT). She had no symptoms of sinusitis. There was no evidence of sinusitis on the Waters’ and Caldwell views; therefore, we did not perform paranasal sinus CT. The next day, the patient was found to have severe dyspnea and hypoxemia. She was endotracheally intubated. After stabilizing her thyroid hormone levels in order to prevent thyrotoxic crisis (thyroid storm), the patient underwent a total thyroidectomy. During the surgery, we noted diffuse enlargement of both thyroid glands. Papillary-like inflammatory infiltration was seen in the peripheral portion of both thyroid lobes with internal hemorrhagic necrosis. Histopathological examination and staining of the surgical specimen with methenamine silver revealed extensive necrotic tissue with many fungal yeast and hyphae characteristic of Aspergillus species (Figure 4). The patient was started on intravenous Amphotericin B. The remainder of the postoperative days were uneventful. The patient was discharged on the 20th postoperative day. The patient is on follow up and has been free of the disease for two years. Figure 1. A 29-year-old woman with SLE complaining of fever and neck mass and neck mass. 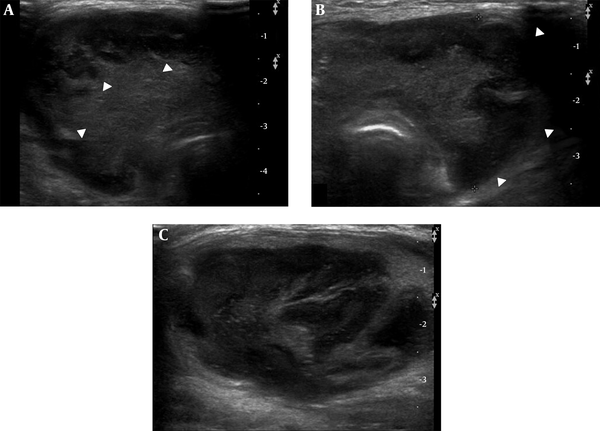 A, Transverse and B, Longitudinal sonography shows enlarged right thyroid gland with internal ill-defined hypoechogenic lesion (arrows); C, Color Doppler exam reveals decreased to absent flow in the affected areas of the right thyroid gland; D, Transverse image of left thyroid gland shows unremarkable findings. Figure 2. Follow-up sonography two weeks later showing significant enlargement of both thyroid lobes. A and B, Transverse image shows subcapsular distribution of the irregular and hypoechogenic lesions (arrowheads); C, Longitudinal image shows enlarged thyroid gland with lobulating contour. Figure 3. Technetium-99m pertechnetate thyroid scan shows large photon defects of both thyroid glands (arrowheads). Figure 4. Photomicrograph (original magnification 400; methenamine silver staining) revealed fungal hyphae in a background of necrosis. Individual hyphae with dichotomous 45 degree branching and septation is characteristic of Aspergillus sp. All procedures were in accordance with the ethical standards of the responsible committee on human experimentation (institutional and national) and with the Declaration of Helsinki of 1975, as revised in 2008 (5). Informed consent was obtained from the patient. Most cases of fungal thyroiditis are reported in immunosuppressed patients. Aspergillus species is the most commonly reported fungal thyroiditis. Fungal thyroiditis can manifest as subacute thyroiditis with local and systemic symptoms. Neck swelling and pain are common due to thyroid enlargement. Dysphagia was also presented due to esophageal compression. In severe cases, fatal respiratory failure from airway obstruction can occur (7). Clinically, local signs and symptoms of fungal thyroiditis are indistinguishable from symptoms of other infectious thyroiditis, including fever, neck pain, thyroid enlargement associated with dysphagia and dysphonia (8). Transient hyperthyroidism presented during the destructive phase of acute thyroiditis, and hypothyroidism followed (9, 10). The clinical features of our patient were similar to those reported previously. She developed thyroiditis while she had active SLE treated with high-dose steroids and cytotoxic agents. Invasive aspergillosis of thyroid gland starts from hyperthyroidism in which glandular destruction causes the release of thyroid hormone (11). However, in our case, hyperthyroidism was worsened despite treatment with beta blocker and steroid with progression of swelling of the thyroid gland. The survival rate of patients with invasive aspergillosis depends on the early diagnosis and prompt initiation of treatment. Sonography is the primary diagnostic modality of thyroid disease. However, a specific sonographic finding of fungal thyroiditis has not been reported. According to PubMed search, only one similar case has been reported. The sonographic finding of the reported case was multiple cystic abscess formations in both thyroidal lobes (5). In our case, initial sonography showed enlarged right thyroid gland and ill-defined hypoechogenic lesion mimicking subacute thyroiditis or tuberculosis. Follow up sonography revealed a markedly increased size of both thyroid glands with lobulating contour. Diffuse hypoechogenic lesions infiltrated in the subcapsular area of both thyroid glands on transverse image without vascularity. The central portion of both thyroid glands showed isoechogenicity. We correlated sonographic features with histopathologic diagnosis. The peripheral hypoechoic lesions were inflammatory infiltrations, whereas the central isoechoic lesions were hemorrhagic necrosis. Fine needle aspiration (FNA) cytology and culture have been the most frequent diagnostic tests used to diagnose Aspergillus thyroiditis. Niazi et al. reported that molecular method was the best method to diagnose aspergillosis, and the enzymatic-immunological method was suited for early diagnosis (12). We missed a chance of FNA because the patient’s dyspnea worsened rapidly. If a diagnosis of fungal thyroiditis is made, the treatment usually includes aggressive surgical resection in addition to systemic antifungal therapy. Nonpurulent fungal thyroiditis has been treated successfully with antifungals including amphotericin, voriconazole, and caspofungin. For disseminated disease, reduction of immunosuppression can also help (5). We reported the sequential sonographic features of invasive aspergillosis involving only the thyroid gland diagnosed by total thyroidectomy. Suspicion of aspergillosis should be raised for patients who are at risk of fungal infection. Sonographic features of Aspergillus thyroiditis were ill-defined hypoechoic lesions initially and then progression of hypoechoic infiltrations in the entire thyroid gland with marked swelling. These findings can be helpful for differentiating primary invasive aspergillosis from subacute thyroiditis. Authors’ Contribution: Su Ho Kim, Jee Young Kim, and Woo Chan Park diagnosed the patient and prepared the manuscript. Mee Kyung Kim assisted in the diagnosis.